I feel that Nokomis Craft Ales' logo is one of the best logos in Canadian craft industry.. it's simple, it expresses Saskatchewan so well and it has something to do with beer.. in fact, I could see farmers wearing old tattered hats with that logo, replacing their old farm implements dealership hats that have seen better days. It's been three years since I've first tried Nokomis' beers and I haven't had a chance to try any until recently while I was in Saskatoon. 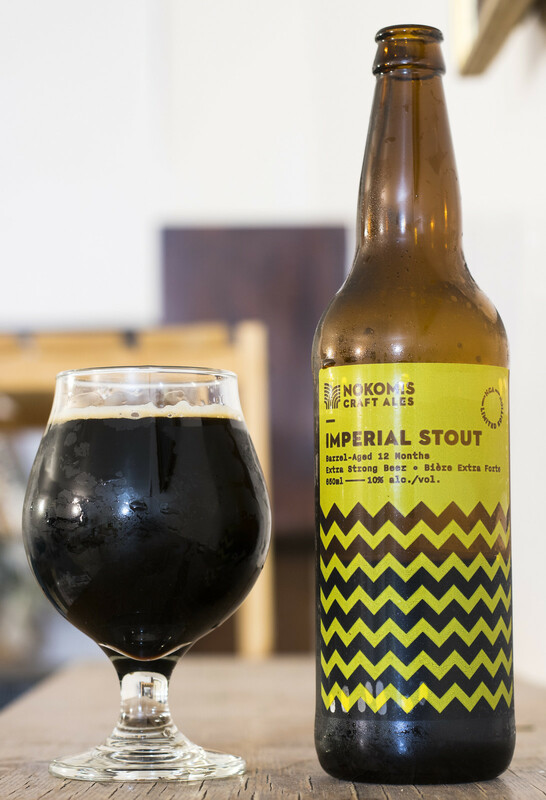 Tonight I'm checking out their Limited Edition Imperial Stout, which is barrel aged for 12 months and tops out at 10% ABV. Appearance: This pours a thick, heavy black molasses with a hint of cola brown hue to it. There's a light amount of yellowish-beige head on top, no noticeable carbonation. Aroma: This is quite a strong one - full on barrel. There's a heavy dosage of whisky, oak, vanilla, and caramel - that's all from JUST the barrel alone! The beer sans-barrel gives off a moderately roasted coffee aroma with a faint milk chocolate aroma. The barrel aged aroma is getting me a bit tipsy it seems! Taste: A sweet, somewhat roasty, very boozy stout. The first thing I get is a big hit of whisky, as if someone poured a shot or two into a stout. I'm also getting a good deal of oaky woodiness, vanilla, and sweet caramel. Somewhat roasty coffee notes in here that don't seem to be anywhere near as roasty as most stouts. There's also notes of black licorice and a hint of chocolate popping up here and there. I'm getting a bit of a burn from the alcohol in this beer.. whew! Overall Thoughts: This is something I should've shared with someone else.. the alcohol is very much present and with it being a 650mL bottle.. this may be my downfall! Very tasty, creamy and worth savouring on a night like tonight.